How to export XLS to TIFF via the command line? 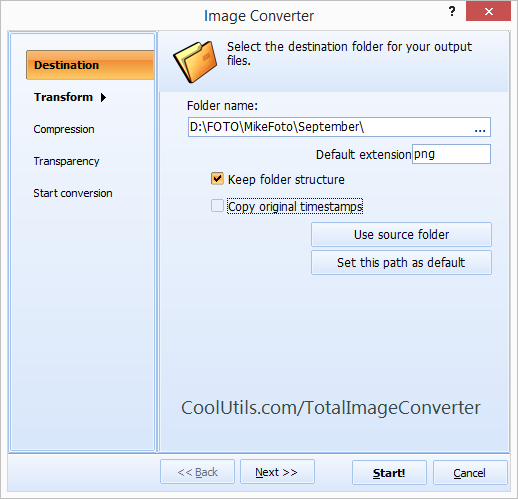 You are here: CoolUtils > Total Image Converter > How to export XLS to TIFF via the command line? 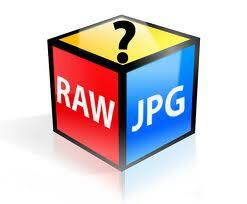 How To Process Raw Images: Is JPEG Any Better? It is a well-known fact that raw images reflect reality better than compressed images, because they contain pure data received from light sensors, which are incorporated in all digital cams. Thanks to excess data contained in raw images, they appear to be more editable than compressed JPG images. In order to understand the structure of a raw image, we should figure out how the light sensor works. A light sensor is a congregate of photocells, which convert light to electricity. Light sensors differ in the number of photocells, and the more photocells a light sensor has, the better the resolution and therefore image quality. Each photocell is responsible for a certain light spectrum area, and most light sensors have photocells arranged in the Bayer filter fashion. This is a mosaic of red, green and blue color sensors arranged on a square photosensor grid with two green, one red and one blue sensor cell. Bryce Bayer used this pattern to mimic the luminance perception of the human eye, since the number of green-sensitive cells in the human retina exceeds that of red- and blue-sensitive ones. Therefore, most cameras feature light-sensors using the Bayer filter algorithm. An image is nothing less than a mosaic of three combined microscopic single-color pictures. Missing details are added and unwanted elements are deleted by the approximating filter, which is activated at the stage of image formation. Today, most cams have a function, which saves raw images. Needless to say, there is hardly a compressed image format to match raw images in quality. What's really great about raw images is that they have a much broader dynamic range than compressed images and offer a variety of exposure settings. A broad color spectrum ensures better color reproduction, noise reduction and correction of lens distortion. First, raw files contain excess data and therefore they take up much more disk space than compressed files. A raw image can be ten times bigger than its JPG equivalent. This is too much for even advanced memory cards to handle. Second, large amount of data slows down the shooting process, since it takes more time for the cam to process all the data. As a result, the photographer ends up with fewer images produced per unit of time. Third, data processing requires higher operative memory. Finally, there are compatibility issues, since many digital cam manufacturers use their own raw image specifications. However, all these disadvantages turn out to be but minor inconveniences compared to the extensive range of editing opportunities offered by raw formats. This appears to be particularly evident when it comes to using various image editing tools. Having achieved the best quality level, you can convert your image(s) to JPG and save them on any disc. More often than not, it takes more than an hour for a photographer to shape an image in his/her most preferred fashion. Most editing tools use the non-destructive editing principle, which allows users to save changes even after closing and opening repeatedly. When you have used all options you've been intent on using, you can convert your images to a compressed format with no visible detriment to image quality. 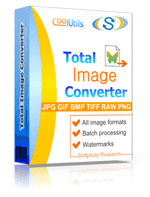 For that purpose, you can use Total Image Converter. 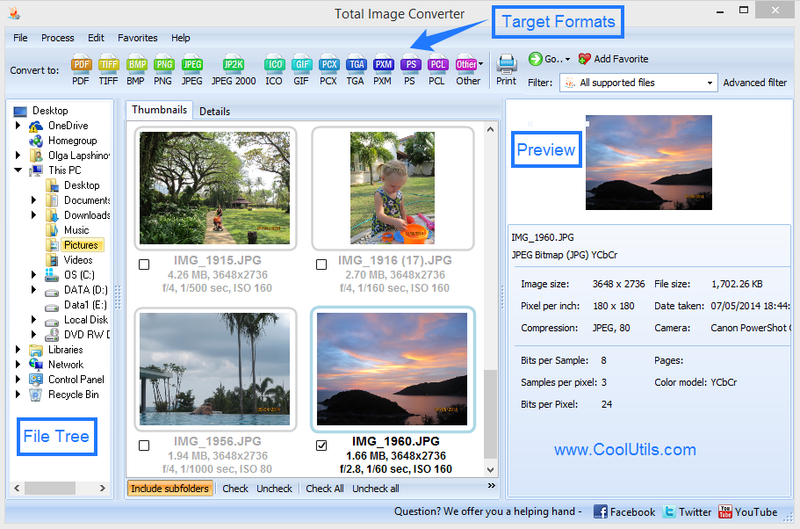 This is a new image conversion utility, which supports a variety of formats, including RAW formats. Thanks to extensive functionality, this tool has gained enviable reputation among novice and professional photographers. Featuring a built-in image viewer and a broad palette of editing options, Total Image Converter has proven to be one of the most effective raw image converters.